As W.AG publicly presented their new TWIST for the first time at the last FachPack, it was immediately clear to experts that the sophisticated design set benchmarks in every detail with regard to the functionality and flexibility of this plastic case. A few months later the company presented two more standard models of the TWIST and extended the range to a total of nine sizes. In doing so, this case has become recommended for many other applications within transport, product protection and presentation of goods. Geisa, February 2017. – With the new TWIST W.AG has created a plastic case, which has an extraordinarily puristic design that exhibits a plurality of highly practical details, which make it an ideal solution for many transportation, protection and presentation tasks. Since the company began with the product launch of initially three TWIST cases of various heights (74 mm, 104 mm, 134 mm) in the basic format 340 x 286 mm, it has added wood to the fire with two more basic formats, each with three heights. Thus the TWIST model range currently consists of nine sizes. By the end of 2017 W.AG will have expanded the selection to 15 case sizes. The TWIST offspring models are of the basic format 290 x 254 mm and 391 x 304 mm. This means that they complement the previous premiere range with a trio of smaller dimensions (approx. DIN A5 format) and a trio of larger sizes (approx. DIN A4 format). Since the new models are each available in three heights, the W.AG TWIST will be of interest for many other applications. The largest version with internal dimensions of 370 x 230 x 150 mm offers, for example, sufficient space for technical equipment, tools or components that require more height because of their geometry. The largest TWIST models to-date are also perfectly suited for educational games, quality toys, therapy test kits or seminar documents. Contrary to this, the new small ones are an interesting solution for the secure storage of metrological, laboratory and medical instruments. 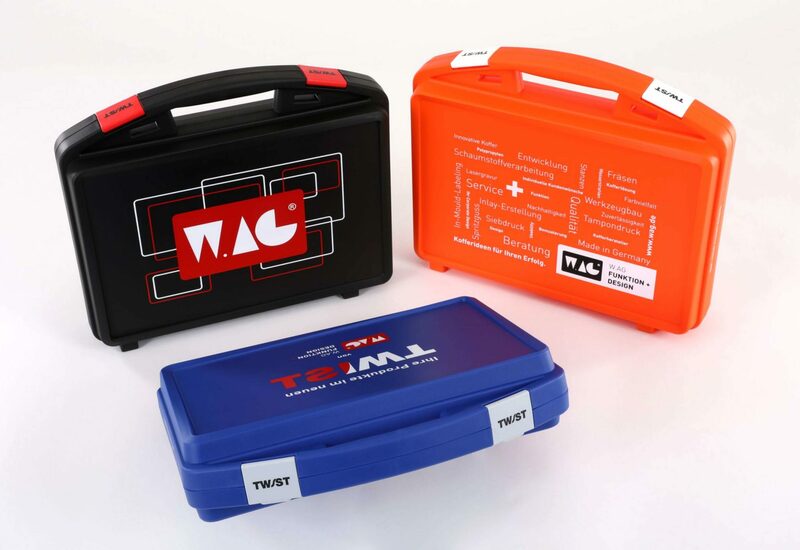 W.AG has integrated an abundance of innovative features into the TWIST design, which currently make these plastic cases unique on the market. At first glance it is the very generously-sized decorative face of the TWIST’s trunk in relation to its case dimensions that catch your eye. It opens up a lot of space for an almost full-surface print using the inexpensive screen-printing process. Thus company logos, product information, advertising slogans, schematics, safety tips and many other single- or multicolour designs can be printed onto the case. The manufacturer, W.AG, is able to fulfil every customer’s requirements that the process is able provide. Alternatively, there is the possibility of four-colour photo printing in the in-mould labelling. Thus brilliant images can be actualised, which are insensitive to moisture, temperature changes, UV radiation and scratches. The TWIST stack frame surrounds the large decorative surface. Nestled into the overall design of the case, it is only at a second glance that you see its special shape: it has a multiple torsion which ensures that all TWIST cases of the same basic format can be stacked safely. More obvious than this axial-twisted stack frame are the other design advantages of the TWIST: rounded edges, ergonomic case handle, stable bag feet, wide eyelets (for the optional shoulder strap) and the clip closures which are pleasant to grasp, in which the company or product logo can be imprinted. Moreover, the attachable lid positioner (practical for product presentations or mobile service work) and a circumferential tongue and groove system (splashing water and dust protection) are part of the TWIST design concept. When selecting the colour of the casing and locks, the customer can select from an abundance of standard and special colours. For many applications an interesting alternative is also to have casing shells made of transparent polypropylene. Incidentally, W.AG has also purposefully placed the handle, closures and strap eyelets outwards on the TWIST so that the interior of the case remains almost free of disturbing ribs and edges. It is therefore, not only optimal for its content but is also suitable for wipe-down disinfection, as is required in medical and laboratory technology. 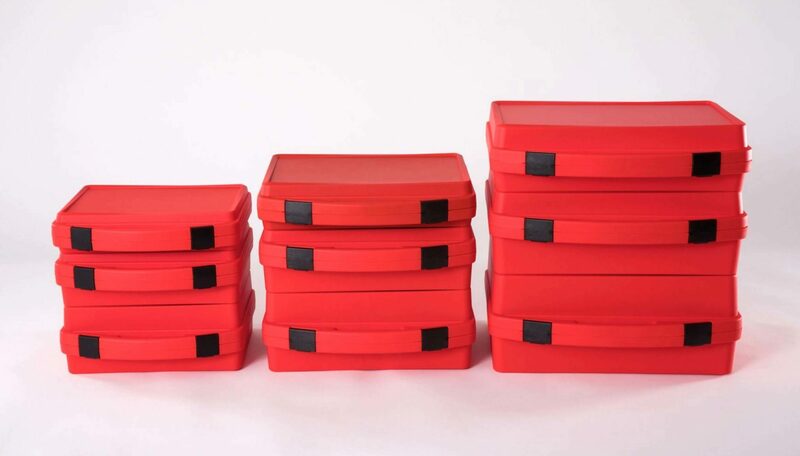 And as with all its cases and box products, W.AG offers the possibility for the production of custom-made PU soft and PE hard foam inlays or deep-drawing inserts for the secure storage of any content. 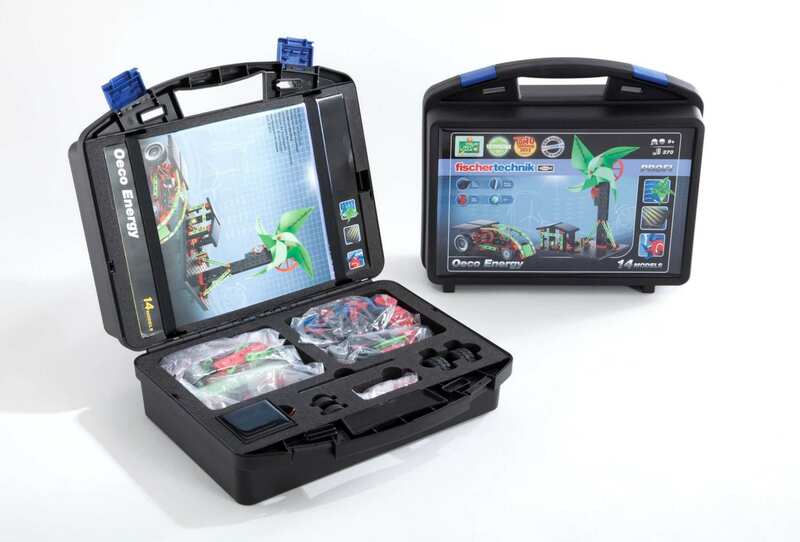 The new TWIST case sizes are ideal for educational games, quality toys, therapy test kits or seminar documents. Exquisite and functional: through the expansion of the model range the W.AG TWIST plastic case is now also suitable for products that require higher internal space. The picture shows a design with high-quality IML photo printing and inlay of PU soft foam. Product family of nine: the W.AG TWIST offspring models have the basic format 290 x 254 mm (l.) and 391 x 304 mm (r.). They complement the existing range (m.) with a trio of smaller dimensions (approx. DIN A5 format) and a trio of larger sizes (approx. DIN A4 format). All basic formats are each available in three heights. The TWIST’s very generously sized decorative face by W.AG in relation to the case dimensions provide plenty of space for virtually full-surface printing – for example, in low-cost screen-printing process.